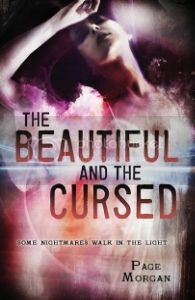 Several months ago, I participated in the cover reveal for The Beautiful and the Cursed. Since then, the cover has been updated, and the UK version has been finalized. This is one book that I'm very excited to read, and I'm glad to share these new covers with you! And now, without further ado, I present the new cover for THE BEAUTIFUL AND THE CURSED by Page Morgan! Fans of Cassandra Clare's Mortal Instruments series and Libba Bray's Gemma Doyle trilogy will devour The Beautiful and the Cursed, a wholly original interpretation of gargoyle lore. Ingrid Waverley is a young woman to be reckoned with. Faced with her brother's mysterious disappearance after an abrupt move to Paris, she is determined to discover what has happened to him. Soon she and her sister Gabriella are drawn into a Parisian underworld more terrifying than they could ever have imagined, but watching over them are two impossible (and impossibly handsome) young men. Luc is a 'Dispossessed', an ancient gargoyle whose sworn duty it is to protect the humans who inhabit his abbey. Nolan has secrets of his own too. He is a member of the Alliance - a shadowy group dedicated to keeping Paris safe from the demonic forces that threaten to destroy it. About the Author: Page Morgan has been intrigued by les grotesques ever since she came across an old, black-and-white photograph of a Notre Dame gargoyle keeping watch over the city of Paris. The gargoyle mythologies she went on to research fed her imagination, and she became inspired to piece together her own story and mythology for these complex stone figures. Page lives in New England with her husband and their three children. Which cover do you like best? I think the US cover is beautiful, but the UK one is definitely eye-catching and striking. What do you think? Both are great covers! The UK reminds me of Underworld the movie. LOVE the new font on the Beautiful and the Cursed, it's not as flourish-y which is a nice contrast with the bright colors I think. Such a pretty cover:) Thanks for sharing Christin! I always find the way that covers vary from country to country to be very interesting.